A productive dialogue on Biodiversity protection was engaged between scientists/researchers, practitioners in the management of protected areas and policy-makers, 23-24th October, in Barcelona, during a knowledge sharing event organised by the Med Biodiversity protection community, co-funded by the Interreg Med programme, under the umbrella of PANACeA project. During three days, small fisheries co-management models, scientific data sources and new methodologies for monitoring climate change and marine litter were the focus of an open debate helping to bridge the gaps between science, management practices and policies. The need for a better coordinated approach to natural resource protection and management has been the final joint message of the more than 100 representatives from national, European and Mediterranean institutions gathered in Barcelona. The principle of co-responsibility was recognised as the basis for the identification of a joint action plan proposed to help fill the gaps in joining current policies, management practices and environmental science needed for an effective management of biodiversity and therefore protected area management. Participatory social mechanisms for governance and integrated scientific data to support policies and instruments affecting biodiversity have been highlighted as the key for the success of protected areas as repositories of a Mediterranean biodiversity that supports more than 20 countries in the region. Sergi Tudela, Director General for Fisheries and Marine affairs, Government of Catalonia highlighted the need “to shift to tailored management, to the right scale; the empowerment of stakeholders will make the difference and co-management will encapsulate all those principles” to sustain small-scale and artisanal fisheries. Camino Liquete from DG Environment, European Commission, commented the need for better coordination of projects underway and the relevance of creating such a multi-actors platform for dialogue and sharing knowledge. “It is essential that the results from research projects are integrated, synthesized and channelled to the right policy-makers. Marine Protected Areas are a way to reach a Good Environmental Status (GES) and can support Member States in the implementation of the Marine Strategy Framework Directive objectives”. Ruthy Yahel, member of the Scientific Committee of the Mediterranean Network of Protected Area Managers, stressed the fact that “the need to invest in good Marine Protected Area management is crucial” to be effective and sustainable. To close the circle of debates, key challenges in integrated ecosystem monitoring and management were scrutinized. Even if the Mediterranean area is well studied, the information is scattered and decision-makers are still reluctant to take evidence-based decisions. “We need more coherence between scales, and between disciplines and policies” concluded Sylvain Petit, programme Officer, UNEP MAP PAP/RAC. The three-day dialogue, organized by the Interreg Med project PANACeA with the participation of other MED biodiversity protection projects has increased the understanding of the impacts of human activities on Mediterranean natural ecosystems and address the increasing need to coordinate scientific criteria and data and its integration into decision making and management processes. 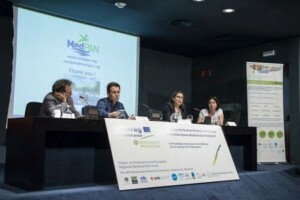 Participant organisations included the partners in the Interreg MED project PANACeA and a wide audience of actors involved in European and Mediterranean policy, projects and initiatives active in the field of conservation science, public administration of natural resources and regional conventions affecting biodiversity.